SMART technology turns Big Data into SMART data. Dedicated Media’s advanced platform drives performance beyond the click. 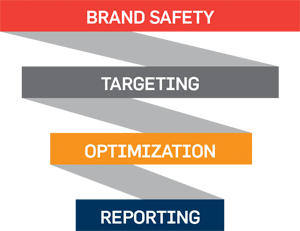 Brand Safety – We protect the value of your brand. Advanced Targeting – We reach the right audience. Intelligent Optimization – We drive better results. Insightful Reporting – We deliver instantly actionable insights. Beyond just big data…beyond algorithms (we still leverage both)…Dedicated Media brings insight to your data. More than a performance report, our insights provide the information you need to uncover untapped audiences and revenue streams, while controlling ad spend. Advanced targeting of your campaigns. Beyond just Contextual, Behavioral, Segmenting, and Custom Channels. Targeting strategies unique to YOUR campaign across all digital channels. Insights beyond click analytics. Gain direct insight from your audience and leverage that information to inform current and future media buys. Discover the outliers that drive performance and brand awareness. Awarded two years in a row for our commitment to brand safety, Dedicated Media proves its dedication to our clients by operating in a brand safe environment. Never under-estimate the peace of mind knowing your messaging runs where you want it to run. Do you really know where your traffic comes from? We do. Not only do we pride ourselves in our transparency, but we police the traffic for our top clients, ensuring that only quality traffic drives their campaigns…and in turn drives their back-end goals. Everyone can, but does everyone truly optimize campaigns? Look beyond the click to the real indicators of success that drive performance and revenue from your campaign.